Camping can be a great way to get out & explore the outdoors as a family and go to new & different areas. It’s also a way to just get away from the hustle & bustle of life & have a relaxing & low-key vacation. What we love about camping is that it can be quite frugal, too, so it’s a great way to still make some fun family memories but on a budget! We have put together a list of some highlights of campgrounds around the Northwest that are $20 or less. This is obviously not a comprehensive list as there are way too many to list, but just some highlights of various areas around the Northwest. 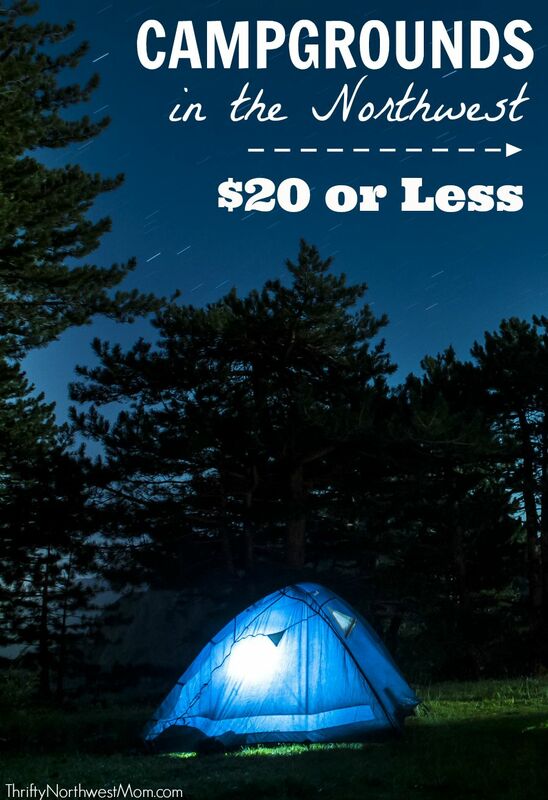 We’ve also listed below some different resources & options of more places you can look to find campsites $20 or less. Make sure to also check out our FREE camping sites in Washington & Oregon, which is filled with some great resources on ways to camp for free or at a significant discount, as well as a number of camping sites where you can camp for free all around the Northwest! We’d love to hear what your favorite campgrounds are around the Northwest & why it’s your favorite place to visit! The majority of National Park campgrounds are $20 & under – they typically range from $15 – $20 – although we found ones even cheaper and we’ve listed the highlights in our big list below of specific campgrounds. Most National Park & National Forest campgrounds are non-reservable, which means it is first-come, first serve. This can be a good thing if you decide to be spontaneous and go camping that weekend – just make sure you get there early (by late morning on busy weekends) to get a spot. There are some that do take reservations, and we have noted that below. It is also important to check their website for any updates on current road closures, weather conditions and other kinds of updates you will want to know about before considering one of these campgrounds. Below we list out Washington State campgrounds and Oregon Campgrounds that we have found to be $20 or less. If you know of more to add to this list, let us know! Olympic National Park Campgrounds – Kalaloch Campground right on the WA coast (gorgeous campground & views by the way from this area) and Sol Duc are the only campgrounds in this park that accept summer reservations. The other sites are based upon a first come first serve basis. Mt Rainier National Park Campgrounds – There are 3 campgrounds available for tent camping – Cougar Rock, Ohanapecosh (these are both open to online reservations ) & White River campground. North Cascades National Park Campgrounds – There are car campgrounds (accessible by car), camps accessible by boat, & wildness campgrounds all in this area. The majority of the sites available are on a first come first served basis. Lake Roosevelt Campgrounds – This is up in the area near the Canadian border of WA & British Columbia in eastern WA & there are 27 campgrounds up in this area, either accessible by car or by boat. These sites are also open for camping all year long. Crater Lake National Park Campgrounds – there are 2 car-accessible campgrounds in Crater Lake, plus you can also do back-country camping. Only open for summer camping. The Washington State campgrounds & Oregon State Park campgrounds can vary quite a bit in price (especially when you’re looking at RV camping versus tent camping), but I did find a number of the tent camping spots were under $20 for various campgrounds, especially if they were more primitive (not as many amenities). You’ll want to go thru & check the areas you’re interested in on the maps/lists to see which ones are under $20 in the area you are looking to camp. Recreation.gov – this is a site you can see lists of campgrounds & amenities as well as reserve campsites online. Find Oregon Campsites and Washington campsites. Bureau of Land Management Website – This is an official resource for BLM lands in Washington and Oregon. You can search on camping as an option & then the area & it will give you a list of places to camp – you will then need to go thru & check out the rates (some may even be free), amenities & other features. Campendium – This is a helpful resource to give you the names of various campgrounds although it doesn’t provide a lot of information about the individual campgrounds (unless community members have reviewed that campground). But once you have the names of various campgrounds for an area, you can then google those campgrounds specifically to find out more about them. What I like is they have it broken down by state into free camping sites, National Park Campgrounds, National Forest campgrounds and State Parks campgrounds. Newhalem Creek Campground – North Cascades National Park – Marblemount, WA – There are 111 campsites available here for $16/nt. Tent camping is allowed with a max stay of 14 days. This is a newer campground that requires reservations. It has paved loop roads, paved site parking, and raised and level tent pads. There are also plenty of sites suitable for an RV. There is a dump available but no water or electricity. Reviews recommend taking the short hike to the falls behind the powerhouse in Newhalem. Camping is available during the season of May through September. Swift Creek Campground – Mt. Baker-Snoqualmie National Forest – Concrete, WA – This campground costs $18 per night with a maximum stay of 14 days and 50 sites available. Reservations are required for some areas but you can do that once you arrive, plus there is a first come first served area available. There are no hookups but there are scattered water faucets and pit toilets. This is a popular spot during fishing season. The nightly rate is $18. South Beach Campground – Olympic National Park – Forks, WA – While there is no water available here, you can get beach access from your site for only $10 per night. Bathrooms have flush toilets with non-potable running water. The fee drops to only $5 per night for seniors. The site is first come, first served, but all sites have beautiful views. There is no shade so it is perfect for solar RVs. There are 55 sites available for camping. Kalaloch Campground – Olympic National Park – Forks, WA – This campsite costs $22 nightly (so slightly higher, but a popular area). Many of the spots are for small RVs or tents but it can accommodate large motor-homes or trailers as well. There are lots of beaches around this campsite but the site itself is forested with little ocean view. Spots can be reserved in the summer, although they do fill up fast. The campground is clean with good restrooms but no showers. A max day of 14 days is allowed. Horseshoe Cove Campground – Mt. Baker-Snoqualmie National Forest – Concrete, WA – This popular destination includes 38 tent/trailer sites, 2 of which are double units and 3 group sites. Twenty five campsites are reservable while the others are first come, first served. Flush and vault toilets are available as well as potable water. It costs $18 per night for single site campsites and day use is $5.00. Day use includes a swimming beach and a gravel boat launch area with parking. Kulshan Campground – Concrete, WA; This campground is free from Labor Day to Memorial Day and costs less than $20 per night during the summer. It includes flush toilets, water, hiking trails, and views of Mt. Baker. Hoh Campground – Olympic National Park – Forks, WA – This campsite is $20 per night and reservations are first come, first served. Surround yourself with moss and ancient trees in this rain forest. This campground offers summer ranger programs and some riverside campsites. There are 88 total sites and the dumpstation costs $10 per use. There are flush toilets and potable water available. Elwha Campground – Olympic National Park – Port Angeles, WA – There are 40 sites available here for $20 per night. Most RV sites are for 21 feet while there are a few for 35 feet. There are flush toilets and potable water available in the summer while pit toilets and no water in the off season. Heart O’ the Hills Campground – Olympic National Park – Port Angeles, WA – There are 105 sites available here at $20 per night. Surrounded by old growth forest, this campsite offers summer ranger programs and family fun. Flush toilets and potable water are available and it is handicap accessible. Falls View Campground – Olympic National Forest – Quilcene, WA – This campsite is $10 per night with no more than 8 people per campsite allowed. Two separate camping loops will accommodate different types of camping vehicles. The right loop offers 14 trailer/RV sites, including six pull through sites for larger RV’s. The left loop has 16 camper/tent sites. There is a vault toilet available but no potable water. Tinkham Campground – Mt. Baker-Snoqualmie National Forest – North Bend, WA – This site is forested with a lot of shade. Camping is $19 per night. There are vault toilets available and a hand pump for water. You can reserve a campsite here through the National Recreation Reservation System. A picnic table and fire ring is available at each campsite and garbage service is available. Ranger Creek Airstrip – Crystal Mountain area past Enumclaw, WA – This park costs $5 per night and has lots of trails and a non-flush toilet. There are 160 campsites available here and biking, walking, hiking, and dog walking are all popular. Moss Creek Campground – Gifford Pinchot National Forest – Bingen, WA – This wooded campground is just north of the Columbia River and has 17 sites available. It is $16 per night with a maximum vehicle length of 32 feet. There are two vault toilets, potable water, and it is the perfect place to camp seasonally with a tent or small RV. Taidnapam Park – County Park – Glenoma, WA – This forested campground allows for year-round camping. There are 163 individual campsites, 96 with water/electric/sewer hookups, 43 with water/electric hookups, 24 walk-in tent sites, 22 group camp with hookups, 4 with water/electric hookups, and 12 primitive group campsites. There are fire rings and picnic tables in all campsites and coin-operated showers. Walk-in tent sites cost $18 per night. Quincy Lakes – George, WA – You need a Discover Washington PAss to park here. It is $10 for a day or $30 for a year and can be used at other locations as well. This spot is located about 2 miles north of George, WA. Popular activities include fishing, hiking, horseback riding, and more. There are boat launches available and pit toilets throughout the area. Johnny Creek Campground – Okanogan-Wenatchee National Forest – Leavenworth, WA – Located near the confluence of Johnny Creek and Icicle Creek, this first first come first serve campground costs $17-$20 per night. There are vault toilets and potable water at this campsite. There are 65 total sites available. Ida Creek Campground – Okanogan-Wenatchee National Forest – Leavenworth, WA – This campground is $17 per site and it has potable water and vault toilets. It is operated by a concessionaire and is wheelchair accessible. There are 10 sites available with a 30 foot maximum length. Swauk Campground – Okanogan-Wenatchee National Forest – Cle Elum, WA – This beautiful campground has 21 single campsites for $18 per night. There is a vault toilet and potable water available here. There is a maximum stay of 14 days here. Mineral Springs Campground – Okanogan-Wenatchee National Foreset – Cle Elum, WA – Located along Highway 97, there are 7 trailer/tent sites available for $18 per night. There is no potable water but there are vault toilets available. Red Mountain Campground – Okanogan-Wenatchee National Forest – Ronald, WA – This campground offers 10 single campsites for $14 per night. There is no potable water but vault toilets are available. American Legion Park – City Park – Okanogan, WA – A spot here costs $10 per night and a maximum of 3 days stay. There are bathrooms and showers open seasonally with access for most RVs but no hookups. Not a pet friendly location but its proximity to an apartment complex across the street makes it a safe location. Stagger Inn Campground – Idaho Panhandle National Forest – Metaline Falls, WA – This campground has 4 campsites with picnic tables, fire pits, and tent pads plus vault toilets and a garbage disposal. Reservations are first come first serve at a rate of $8.00 per night. A small unimproved boat access allows users to launch a small watercraft. Mill Pond Campground – Colville National Forest – Metaline Falls, WA – This campsite is normally $16 per night and is first come, first served. There are 10 campsites with picnic tables, fire pits, and tent pads plus vault toilets and a garbage disposable. There are many recreational activities here and a small unimproved boat access allows users to launch small watercraft. Edgewater Campground – Colville National Forest – Ione, WA – There are 19 campsites here with picnic tables, fire pits, and tent pads for $9/night. There are vault toilets, a garbage disposable, drinking water, and a boat launch available. Noisy Creek Campground – Colville National Forest – Ione, WA – The campground is $8 per night and there are 19 campsites available with picnic tables and fire pits. Amenities include drinking water, vault toilets, and a garbage disposal. There is a day use area open from 6am to 10pm with fire rings, picnic tables, a boat launch and a swimming area. Campsites are suitable for both tent and RV camping. Panhandle Campground – Cusick, WA – This small campground is suitable for tent and RV camping. It costs $16 for a single site and there are 13 campsites with picnic tables, fire pits, and tent pads. Amenities include drinking water, vault toilets, a boat launch, and a garbage disposal. Most campsites are private and within walking distance of the river. Browns Lake Campground – Cusick, WA – There are 18 campsites available for $14/night with picnic tables and fire pits. There is currently no drinking water available but there are vault toilets and a garbage disposale. This lake is non-motorized, fly-fishing only. Gnat Creek Campground – Astoria, Oregon – This campsite costs $5.00 per night to use one of their 4 walk-in tent sites and each extra vehicle is another $2.00 per night. There are sealed vault toilets available here along with picnic tables and trash cans. It is a small campground located on the edge of the forest. Wahtum Lake Campground – Silver Lake, OR – This campground is $11 per night for a single unit and $8 per additional vehicle. There are vault toilets, fire rings, picnic tables, and trash cans. This is a very popular site located just east of the Mark O. Hatfield Wilderness. French Pete Campground – Willamette National Forest – Blue River, OR (east of Eugene area) – This campsite has $16 per night and amenities include picnic tables, toilets, and drinking water. The campground is heavily wooded with Douglas fir and Vine Maple. Access to the Three Sisters Wilderness from the French Pete Creek Trail is located across the road. Frissell Crossing Campground – Willamette National Forest – Blue River, OR (east of Eugene area) – This beautiful and quiet campground is $14 per night. Amenities include picnic tables, toilets, and drinking water. There are 12 sites total and they are first come, first served. Lobster Creek Forest Service Campground – Gold Beach, OR – There are 3 tent sites and 4 tent/trailer sites available here with picnic tables and fire pits for $10 per night. There is a gravel bar for day use fishing or picnicking, firewood available for purcahse, a boat launch, garbage disposal, 2 restrooms with 4 flush toilets ecah, and drinking water. Williamson River Boondocking – Chiloquin, OR – There are 20 campsites availalble here, first come, first served. It costs $10 per night for a single unit and $5 a night for each additional vehicle. Amenities include tent camping, picnic tables, vault toilets, drinking water, and parking. Fishing is a popular activity here. Ludlum Campground – Rogue River-Siskiyou National Forest – Brookings, OR – There are 7 campsites with barrier free picnic tables and fire pits. There are flush toilets and drinking water available along with a garbage disposal. It costs $10 per campsite and is just minutes from ocean beaches. There are plenty of hiking opportunities available here as well. Miller Bar Campground – Rogue River-Siskiyou National Forest – Brookings, OR – This site is operated as a dispered site on a large river bar. Enjoy summer fun in the crystal clear water. Tents or small trailers only at $10 per night. Quiet hours are between 10pm and 6am. There are vault toilets but no drinking water. Open seasonally May through September. Nook Bar Campground – Rogue River-Siskiyou National Forest – Brookings, OR – Tents and small trailers can camp here for $10 per night between May and October. There is a garbage disposable available from May 15th through September 15th. There are vault toilets available but there is no drinking water so make sure to pack some. Humbug Mountain State Park – Port Orford, OR – Tent sites are available for $17 per nigth while electrical sites are only $22. There are more than 55 tent sites with water nearby and approximately 40 electrical sites with water. This campground enjoys some of the warmest weather on the Oregon coast. Many visitors enjoy windsurfing and scuba diving. Hot showers and flush toilets are available here. Quosatana Campground – Rogue River-Siskiyou National Forest – Gold Beach, OR – There are 43 campsites available here with picnic tables and fire pits for $15 per night Amenities include drinking water, flush toilets, garbage disposable, RV dump station, fish cleaning station, boat launch, and firewood available for purcahse. Lost Creek Campground – Crater Lake National Park, OR – This campground is $10/night with 16 first-come, first-serve campgrounds. There are flush toilets, sinks & running water. It’s open from early July to mid-October. Senior passes and Access passes get a 50% discount. Daley Creek Campground – Rogue River-Siskiyou National Forest – Ashland, OR – There are 6 campsites available here (3 tent sites and 3 trailer sites) for $8 per night. Amenities include picnic tables, fire pits, and vault toilets. There is a maximum stay of 14 days. Pringle Falls Campground – Bend, OR – This site costs $10 per night for the first vehicle and $5 per additional vehicle and there are 15 single sites available. It is just north of a reserved section of woodland that has been set aside as an experimental forest. There is a vault restroom available but not potable water. Mallard Marsh – Bend, OR – Located next to Hosmer Lake, this site costs $10 for the first vehicle and $5 per additional vehicle and 15 campsites. There is a vault toilet, access to trail for hiking and horseback riding, and there is also a hardened boat ramp located near the south end of the campground. South Hosmer – Bend, OR – Fishing, hiking, horseback riding, bird watching, and canoeing are all popular here. It costs $12 per night for the first vehicle plus $6 per additional vehicle while day use is $5 per day at Hosmer Lake Boating Site. Watch out for mosquitoes in the early season. The sites are well screened from each other by stands of lodgepole pine. Little Lava Lake Campground – Deschutes National Forest – Bend, OR – This campground is $14 a night, 15 sites, and is next to the Little Lave Lake where there are opportunities for fishing, canoeing, swimming and hiking. There is a boat launch area within this campground along with potable water and vault toilets. Point Campground – Deschutes National Forest – Deschutes, OR – Located next to Elk Lake, this campground has 9 sites and is $14 per night with a maximum site spur length of 26 feet. There is no water but there are restrooms as well as access to sailing, fishing, hiking, and horseback riding. There is a boat launch area within this campground. Big River Campground – Deschutes National Forest – Bend, OR – This campsite is just $10 per night. There are vault toilets but no potable water. Boat fishing or drift fishing is a popular way to catch fish as motorized boating is not permitted here. This campground has 10 single sites and easy access just off the road. It is a perfect place to launch a canoe, kayak or tube down the Deschutes River. Fall River Campground – Deschutes National Forest – Bend, OR – This small campground is located next to Fall River and is just $10 per vehicle. There are vault toilets but no potable water. It is an excellent place for a family outing or to drift on the river. The main draw here is the fact there is almost always an empty site, the price is low, and the woods help isolate your site. Sunset Campground – Winema National Forst – Klamath Falls, OR – This spacious campground is $17 per night. There is potable water available and 4 sets of flush toilets. The views of Mt. McLoughling are excellent especially at sunset so make sure ot bring your camera. Amenities include boat ramp, tent camping, trailer camping, picnic tables, drinking water, toilets, and parking. Big Creek Campground – Seneca, OR – This campground costs $8 per night for a single unit and $4 per night per extra vehicle. Popular activities here include mountain biking, hiking, stream fishing, hunting and bird watching along with exploring the Strawberry Mountain Wilderness. There are two vault toilets and potable water available. The campground can accommodate a 30′ trailer with vehicle. Millers Lane Campground – Baker City, OR – This small campground is located on the south shore of Phillips Lake. There are 11 tent/trailer sites and 4 tent-only sites. It costs $8 per night and extra vehicles are $4 each. A vault toilet is available along with picnic tables. This is a popular spot for boating and fishing. Bates State Park – Bates, OR – There are more than 28 primitive sites for tents or self-contained RVs at this location for $11/night, plus a vault toilet, potable water, picnic tables, trash cans and a hiker/biker camp with six sites and electric plug-in. Viewpoints from along the three miles of hiking trails overlook the park, old mill pond, and valley. Hilgard Junction State Park – La Grande, OR – A primitive site here costs $10 per night. There are 18 primitive sites with water nearby, paved parking at all sites, restrooms with flush toilets, horseshoe pits, firewood for sale, an Oregon Trail interpretive shelter, and Grande Ronde River rafting access. Beaver, mink, deer and a variety of birds inhabit the park area and can be viewed throughout the year. Where are your favorite low-cost campgrounds in Washington and Oregon? We’d love to add more to our list based on reader tips or hear feedback from those of you who have gone to any of the campgrounds we have listed!